Ed Wanner gives his Classification Talk. 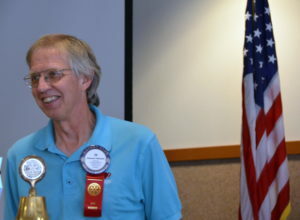 With humor and enthusiasm, new Club member Ed Wanner gave an inspirational Classification Talk last Wednesday. Ed works at MV Advancements, which helps adults with developmental disabilities reach their highest potential and achieve fulfilling lives. He is obviously passionate about his work, and his journey from a pizza-store owner to his current career was full of amazing stories. For example: Ed had some negative experiences at first employing people with developmental disabilities at his store. But then one fellow came along who changed Ed’s point of view completely. This person said his dream job was to work at Ed’s pizza place, and he kept showing up until Ed hired him. This person’s determination, attitude and growth in the job, in spite of his disability, is the reason Ed is no longer in pizzas! Ed quoted Tommy Lasorda, “The difference between the possible and the impossible lies in a person’s determination.” This employee showed Ed that we all have talents. “We just have to find them, and then match them up with work we can do,” he said. We got some insights into how Ed functions, too. Like, how he does long-term planning. (“It’s deciding what’s for dinner.”) And how he overcomes obstacles, like a fear of needles. (“I scheduled myself to give blood. You have to get over it to do that, don’t you?”) And what motivates him. (“Goal setting.”) Like trying to set a “personal best” record time for giving blood, or winning a fund-raising contest in McMinnville by $30 raised in the final moments! Ed shared that he has been married to his wife Cheryl for 40 years, and they have two kids. He also likes travel and adventure. He has biked the Coast from Washington to California, and has been to Copenhagen and Disneyland (many times) with his clients. And now he’s leaving for a trip to Iceland in about 3 weeks……Nice to have you in the club, Ed. Visiting Rotarian Britt Dudek from Wenatchee, Washington attended our meeting. When questioned as to what brought him to Newberg, he confessed: a new girlfriend! Mike Caruso introduced Michael Pollock, who has now applied for membership in our Club. Om had two guests: Elaine Burke and Sharon Champaigne. 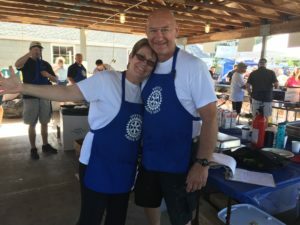 The Morning Club is hosting a get-together at Dr. David Krier’s place in St. Paul to bring some of the service clubs together for a time of networking and fellowship. The BBQ/potluck will feature a pig specially roasted by Dr. Krier. Bring a potluck dish, your chairs and beverage. Roast pork provided! Please RSVP to Leah Griffith by Sept. 5. Did you catch the recent great article in the Graphic about Britta and her work? 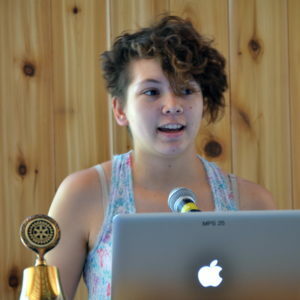 Our summer intern will discuss the history of Rotary in a presentation scheduled for 7 pm. Sponsored by the Newberg-area Historical Society. 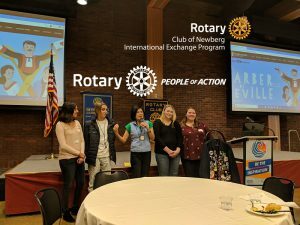 Location is Friendsview’s Springbrook Meadows Community Building, 4061 Hayes St.
We got a peek into the experiences of two very impressive Rotary Youth Exchange students–one in South Korea and one in Denmark– at our meeting last Wednesday. 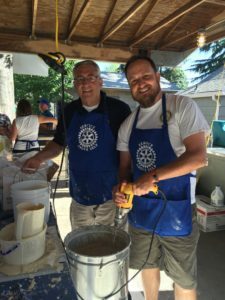 And we saw what a positive impact this Rotary program can have in the lives of the approximately 8000 young people worldwide who participate each year. 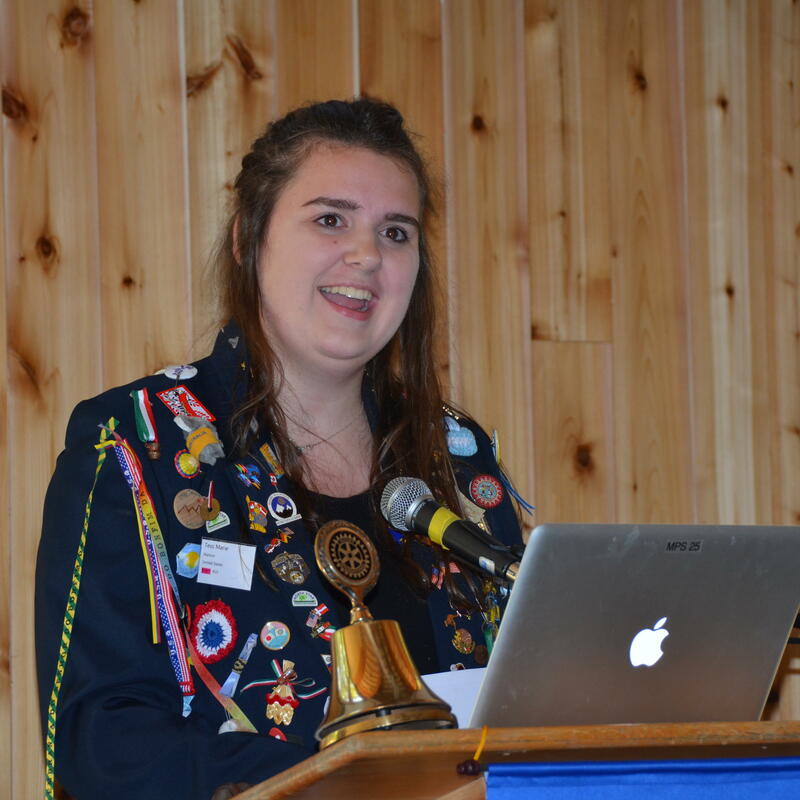 Emily McClean shares her Rotary Youth Exchange story. Her future plans are to pursue a degree in physics. She graduated early from Newberg High School, obtained sponsorship from USC and is leaving soon to study in Paris for a year. Tess Watson said that her time in Denmark “forced her to grow up, to enjoy the moment and to see and appreciate cultural differences.” She stayed with three different host families and learned from each. The people of Denmark eat a lot of potatoes! Tess was able to take a side trip to Sweden to go skiing and later take an 18-day trip around Europe. She showed off her pin collection, which she said is a tradition for exchange students. We were also able to meet the newest exchange student TO Newberg, “fresh off the boat” so to speak. Matilda Harring had arrived just two nights prior from Denmark. Tess’ family will be hosting Matilda during her stay. Special acknowledgment from our club goes to guest Michelle Bechtold, the Youth Exchange Officer with the Early Birds Club, for all her good work administering this program. 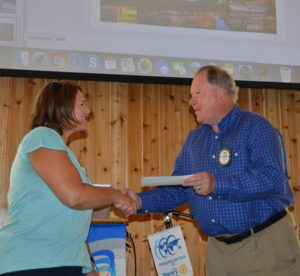 Spike presents a check to Michelle Bechtold for the Youth Exchange partnership program with the Early Birds Club. Spike Sumner presented Michelle with a check for $5000 from our Foundation in support of our partnership. 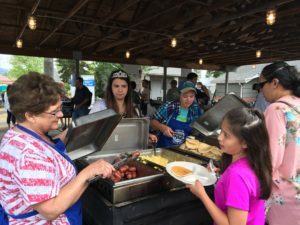 Host families are still needed! Please give some consideration to this worthwhile and rewarding opportunity. Michelle would love to talk with you more about it. 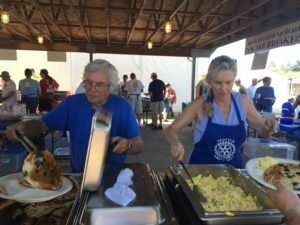 McMinnville Sunrise Club President Larry Strober paid us a visit to tell us about his club’s upcoming bocce ball tournament and wine auction to raise funds for the St. Barnabas Soup kitchen and a barrier-free bocce ball court. It was our last lunch at George Fox. We’ll be at Todd’s House next week (Friendsview), then move to our new location at the Cultural Center on the 31st. 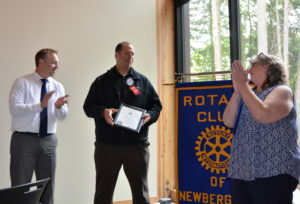 Our guest list also included: Mike Pollock, who is considering membership in our club; Ty Burlingham, visiting Rotarian from Woodburn who was asked about a thousand times when he is joining OUR club; and Kari Fahrenkopf with the Early Birds Club. She was the previous Youth Exchange Officer and is now the committee liaison with our club. And that’s just what we did at our meeting last week. When our planned program did not materialize, President Leah Griffith came up with an alternative that turned out to be both fun and informative. 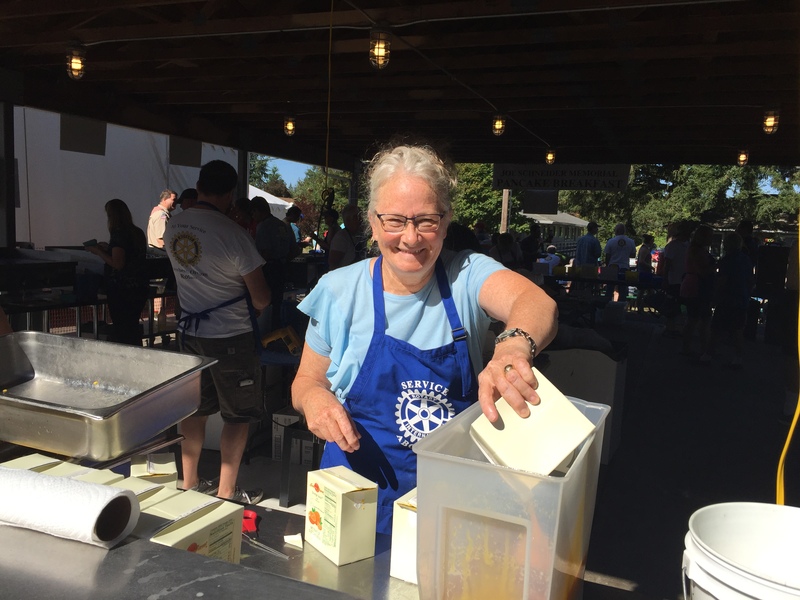 She asked each table of Rotarians to discuss among themselves what they like about the club and what they would maybe change, and then share the results. 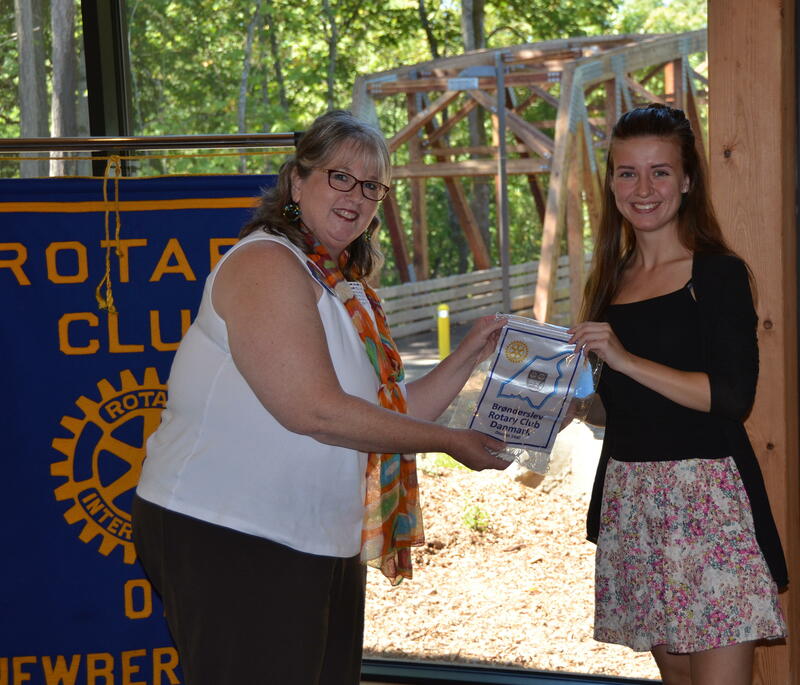 Hear more about service projects such as senior meals, SMART, Habitat for Humanity, etc. Look at our relationship with the Early Birds Club; can we jointly be in better service to the community? Is more synergy possible with other service clubs, like Kiwanis? How about some “dietary innovation” with our lunch menus? Mostly, club members seemed to really like having time to talk with each other, and recommended finding a way to do that more often in the future. Matt Stephens Is our Newest Member! Matt Stephens is inducted as our newest member. President Leah and Membership Chair Mike Boock conducted the ceremony to induct Matt Stephens into our club. Matt has been with Country Financial for 15 years. Originally from Boise, he graduated from Lake Oswego High School and from Portland State. He has worked in the hotel industry and as a Youth Minister. He is married to Amy, whom he met on a blind date, and they now have 4 children. He is also a golfer and active with the Knights of Columbus. 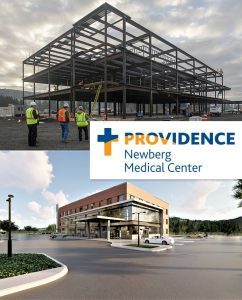 One of his goals is to help individuals and business owners with their insurance and financial services, so give him a call at 503-538-7547. Welcome, Matt! 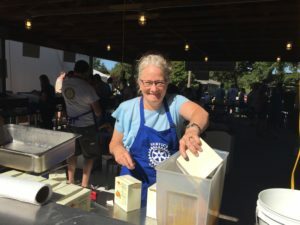 More from Britta on the history of Rotary…..
Britta Stewart, our summer intern who compiled the history of our club and recently gave a presentation on it, will be giving a talk on the history of Rotary at the Newberg Area Historical Society on Aug. 30th at 7pm. Society President Rick Fieldhouse has invited all Rotarians to come on out and learn more about our organization. The meeting will be at the Friendsview Springbrook Meadows Community Building, 4061 Hayes St. Very personal, heart-wrenching stories about the devastating 2010 earthquake in Haiti and the still-dire situation there were shared with us last Wednesday by guest speaker Jacques St. Gelus. Jacques was born and raised in Haiti, and was there when the earthquake happened. 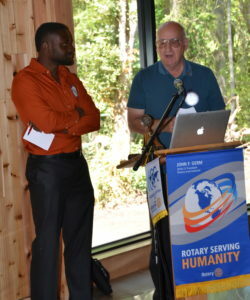 Ralph Koozer introduces our speaker Jacques St. Gelus. 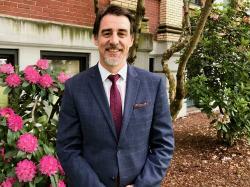 As a result of his experiences during that traumatic time, Jacques changed career direction and is now a nursing student at George Fox. He described how, on a “normal Tuesday in 2010,” the world changed for him. “Nothing was real to me,” he said. “It was like being in a movie.” Over 200,000 people perished in the earthquake, some because help could not get to them quickly and people were not trained in first aid. He plans to lead a group of 15 people on a 10-day serve trip to Haiti in the near future. To participate or donate, you can contact him at missiontohaiti11@gmail.com or call 503-724-6992. To help Jacques with his educational expenses at George Fox, you can visit armmin.org/donate.